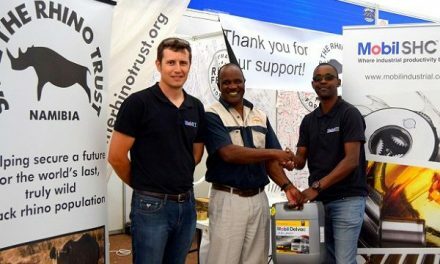 Co-founder of the Save the Rhino Trust of Namibia Blythe Loutit (Standing) and the current Chief Executive Officer of the Save the Rhino Trust, Simson Uri-khob also standing beside a Land Rover Defender in an outdated picture with staff members of the Save the Rhino Trust of Namibia. Loutit passed away in 2005 after a battle with cancer. “Our rhinos are under siege, and SRT is going or the offensive, “ said the Honourable Dudu Murorua, Chairman of the save the Rhino Trust Board of Trustees. The last remaining truly wild population of the desert adapted black rhinoceros Diceros bicornis in the northwestern Kunene Region of Namibia is specifically vulnerable and has been targeted. Koos Verwey, a resource protection specialist, who is an independent consultant supplied by NACSO’s Natural Resource Working Group and part of a Ministry of Environment and Tourism operation supported by NamPol and various stakeholders in the Kunene region to protect Namibia’s rhinos, put it bluntly: “We are fighting a war.”These tough words are being followed with strong actions from save the Rhino Trust Namibia following two days of briefings and planning held between Verwey and SRT Trustees last weekend. Since SRT was founded in 1982, their mandate has been to monitor and conduct research on the rhinos in the Kunene region. With support from MET, conservancies and local community members, the rhino population has grown and expanded over the past two decades. Now the environment has completely changed. Organized crime syndicates target rhinos in the area with lethal precision and available resources cannot compete to stem the tide. To be successful in protecting rhinos requires immediate adaptation of the level of presence in the area. 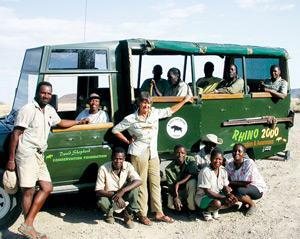 “SRT was founded when Kunene’s rhino population was at the brink of extinction. We’ve come a long way since then, but organized poachers operating in our country pose the greatest threat to rhinos since Independence. After all we’ve fought for, this is unacceptable ,”said Dr. Axel Hartmann, the longest-standing member of SRT’s Board of Trustees. It is no longer enough to track rhinos , SRT is tracking poachers. Working to support the efforts of the MET and the Protected Resources Unit to protect rhinos, SRT is restructuring, redeploying teams throughout the region, and strengthening its staff. 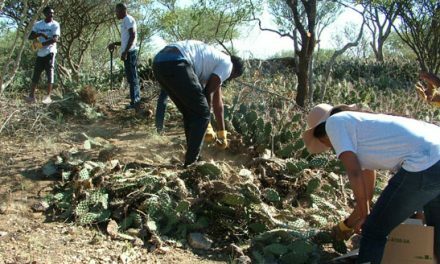 Murorua, who is also Chair of the Kunene Regional Council, acknowledges the challenges of operating in an area totally more than a million hectares that has no national park status. “This is a vast, rugged and open area. We can’t control the people going in and out. But we know this land and these rhinos. This is our strength, and we bring this to the collective cause of protecting Namibia’s rhinos.” Conservancies, the public and the media are partners in this fight to protect our rhinos, and need to be kept informed. However, the need to know is outweighed by the fight to protect the rhinos. Information that could negatively impact an ongoing investigation will not be shared. “The poachers aren’t going anywhere, and we need to dig in for the long run. Make no mistake; in this fight we will lose more rhinos. But we have a great team of dedicated trackers, morale is high and we have broad support,” stressed Verwey. Murorua concurs, “This isn’t about me or SRT or any of the other groups getting involved in rhino protection. It is much bigger than that. This fight is for our rhinos.